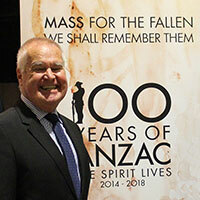 Fr Christopher Willcock sj, composer of the Mass For the Fallen, during the media launch at the Australian War Memorial on Friday 10 April 2015. This weekend, parishes across Australia will sing a mass specially commissioned for the ANZAC Centenary called Mass For the Fallen. The National ANZAC Day Mass at St Christopher’s Cathedral in Canberra on Saturday 25th April 2015 at 8am will be the national premiere. Other masses are occurring in local parishes this evening and over the weekend. Commissioned by Allan and Maria Myers for use in celebrations of the Eucharist on Anzac Day, particularly the Centenary in 2015, Mass for the Fallen was composed by Fr Christopher Willcock SJ. The Mass comprises a setting of the Kyrie eleison, the Acclamations during the Eucharistic Prayer, and the Agnus Dei. It is written for cantor, optional SATB choir, keyboard (organ or piano) and congregation. In addition, there is a setting for soprano solo, choir and piano of the well-known verse from Laurence Binyon’s poem ‘For the Fallen’, entitled ‘We will remember them‘. Fr Christopher said, ‘My brief was to compose a setting that could be sung and played by parishes and communities of average ability, and that could be learnt after a couple of hearings or rehearsals’. Some parishes have taken the approach of simply playing a recording of We will remember them as part of their liturgy. This recording forms part of a project by the Ian Potter Cultural Trust called ‘Gallipoli – a tribute’. It was performed by Merlyn Quaife, soprano and Choir of Newman College, the University of Melbourne. A full list of venues in which the Mass will be sung can be found at: massforthefallen.org.au. This entry was posted in Uncategorized on April 24, 2015 by ACBC Communications.